St Pauls Castle HillNew from Yes! 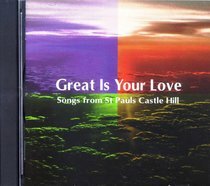 Ministries, St Pauls Castle Hill, 14 fresh contemporary songs allwritten by local talent. Great music for personal devotion as well as being acomplete church resource with enhanced CDROM capabilities which includes thepiano score and overhead masters for each song. About "Great is Your Love"